Boston’s Peter Cehlarik scores on Flyers goaltender Brian Elliott during the first period. 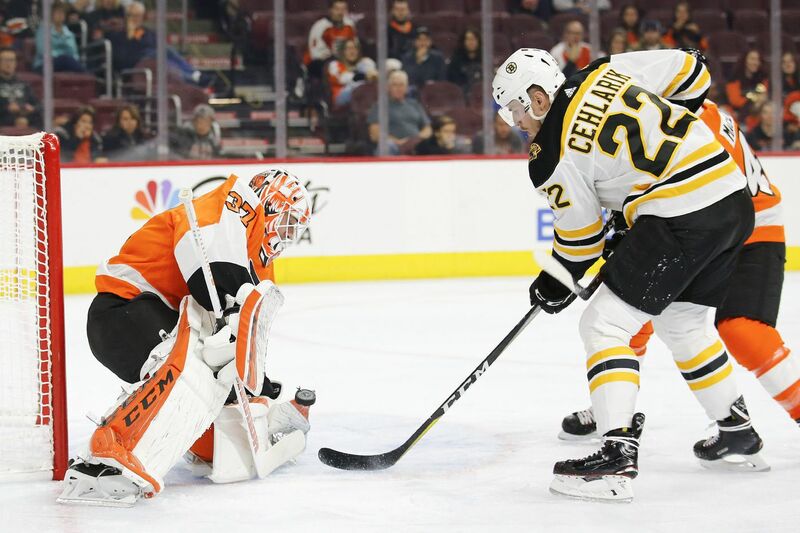 Ostensibly, the Flyers played the Boston Bruins at the Wells Fargo Center Monday night, furiously rallying from a 4-0 hole with three third-period goals before falling, 4-3. The score hardly mattered. What mattered is how Corban Knight played, how Dale Weise played, how Jori Lehtera played, how Mikhail Vorobyev and yes, how Brian Elliott played. Weise scored a shorthanded third period goal after Michael Raffl forced a mid-ice turnover. Vorobyev continued the solid three-zone play that has pushed him to the head of the hopefuls. Claude Giroux added a power play goal, and Travis Konecny an even-strength one, but this was an understandably uneven performance triggered by experimentation more than any talent disparity — the game featured far more Flyers veterans than Bruins veterans. With Elliott coming off offseason hip surgery, and two goaltenders already sidelined with injuries this preseason, EIliott's health is the team's top concern. The Flyers desperately want 20-year-old goaltender Carter Hart to at least begin his first professional season in the more forgiving American Hockey League, and with both Alex Lyon and Michal Neuvirth expected to return in a matter of weeks, they aren't too keen on renting or paying a veteran goalie to fill the voids. So they need Elliott to get well quick, to find his "A" game ahead of maybe even his own schedule. A weekend of practice work began with him slamming his stick repeatedly as he struggled to stop even the more unchallenging shots, but it finished more promising, more representative of his "A" game. The Bruins' first goal Monday night, a soft shot from the circle that was punched at and rolled over his left shoulder, was not. Andrew MacDonald, playing his first game weeks ahead of schedule after suffering a lower body injury before camp, turned the puck over to create the first scoring opportunity and partially screened Elliott for Boston's second goal of that period. In the second period, he picked up a delay-of-game penalty when his clearing attempt sailed over the glass. Well, he got the kinks out, right? The Elliott model that powered the Flyers' second-half surge last season would have shrugged off such an inconvenience. Still, Elliott got plenty of needed work, facing 13 shots in that period alone, and 28 for the game. His best moment came in turning away a shorthanded try halfway through the second, stopping both the shot and rebound, scooping it up confidently. He was not as fortunate on Chris Wagner's shorthanded breakaway later in the period to push the Bruins' lead to 3-0, Wagner sliding it into the far corner of the net as he crossed from right to left. Continuing the extended look he has received in training camp, Vorobyev centered a line with Giroux as his left wing and Konecny on the right. Nolan Patrick centered James van Riemsdyk and Jake Voracek, seeking to develop some chemistry among a projected second line. The veteran Lehtera, fighting for a job amid the infusion of youth, centered Nicolas Aube-Kubel on his left and Weise — another veteran who may be on the bubble — on his right. Scott Laughton, who has bounced from wing to center throughout this preseason, was on the left side of a line centered by the 28-year-old journeyman Knight, who has played the last two full seasons for the Phantoms. That Knight is still here, with just two games remaining after Monday night, is a triumph for him and an insight into what the Flyers seek in upgrades this season. Aube-Kubel, still here as well, was on the left side for the first time this preseason. "We're moving those guys around a bit to see what their strengths are positionally," coach Dave Hakstol said. "It's not all about results. You look at lineups — everybody's all over the place. … It's more so about the performances. If you perform well and play well, you've got a chance to …"
Earn a spot? On Sunday, Flyers general manager Ron Hextall indicated that more cuts may come on Tuesday. "We still don't know exactly what we have this year," said Hakstol. "We're learning that. And every time you go to another step, it tells you a little bit more. We still have another week in camp before we have to decide who we travel west with. And from there, the early part of the season is really challenging."